The Urban Assembly Bronx Academy of Letters, where students complete imaginative research projects and get support from its strong college office, is among the schools with open seats in Round 2. If you are unhappy with your high school match, you may reapply to schools with open seats during Round 2. Keep in mind that if your are an 8th-grader and are matched with a school in Round 2, you forfeit your Round 1 match. Current 9th-graders who are offered a 10th-grade seat during Round 1 or 2 will have the option of remaining at their current school. Attend a Round 2 high school fair: They are scheduled for March 30 and 31, 11 a.m.–2 p.m. at the Bayard Rustin Educational Campus in Manhattan. Try to arrive early so you have plenty of time to meet with representatives from each school you’re interested in. Read our tips on what to do once you receive you high school decision letter. Consider our picks from the Round 2 list, which include schools with a proven record and those that seem promising. Fannie Lou Hamer Freedom High School offers a safe and nurturing community, engaging curriculum and dedicated staff. The school does a good job of lifting up struggling students. These schools still have seats available for 9th-graders with special needs, 10th-graders (general and special education) or both: Bronx Health Sciences High School; Cinema School; Fordham High School of the Arts; Hostos-Lincoln Academy of Science; MS 223, The Laboratory School of Finance and Technology; Marble Hill High School for International Studies; University Heights Secondary School; The Urban Assembly Bronx Academy of Letters; and Young Women’s Leadership School of the Bronx. These large, comprehensive high schools have space for zoned students and some 9th or 10th grade spots available in select themed programs. All offer a large array of classes, sports teams, clubs and activities: Abraham Lincoln; Fort Hamilton; Franklin Delano Roosevelt; Midwood, New Utrecht (zoned only). Bedford Academy is a small, academically demanding school that makes sure students are well-prepared for college. The Brooklyn School for Math and Research (B-SMARt) offers a demanding academic program and good preparation for college. All students tackle four years of math and science and learn Mandarin. At the Cobble Hill School of American Studies students may take interesting classes in law, bio-medicine and cybersecurity. The school has a particularly strong record for students with special needs and those learning English. Edward R. Murrow High School and John Dewey High School do not have any seats left for zoned students, but have 9th- and 10th-grade openings in their bilingual Spanish (Murrow) and Mandarin (Dewey) programs. There are also a few 10th-grade spots in several of their programs. At the Expeditionary Learning School for Community Leaders, students do an unusual amount of research and writing, get lots of academic and college support, complete sophisticated projects and enjoy field trips. High School for Public Service: Heroes of Tomorrow is a Brooklyn gem, posting top graduation rates while also preparing graduates for college-level work. The school has a few 9th grade and 10th grade seats open. Park Slope Collegiate is a small, diverse and progressive school that offers small, supportive classes and an emphasis on social justice. The Williamsburg High School of Arts and Technology (WHSAT) is a small, nurturing place that offers lots of student support, thoughtful instruction and a four-year sequence in computer science. These popular schools still have seats available for 9th-graders with special needs, 10th-graders (general and special education) or both: Benjamin Banneker Academy; Brooklyn Collaborative Studies; Brooklyn College Academy; Brooklyn International High School; Brooklyn Preparatory High School; Leon M. Goldstein High School for the Sciences; Medgar Evers College Preparatory School; Millennium Brooklyn; Science, Technology and Research (STAR) Early College High School at Erasmus; and Urban Assembly School For Criminal Justice. Art and Design is a vibrant high school that combines solid academics with hands-on training in commercial arts. Students participate in internships in the industry and earn professional certifications in a range of skills. Landmark High School offers a warm, close-knit environment where students conduct in-depth projects and complete research papers rather than take Regents. Manhattan Bridges is a small high school that caters to immigrants who recently arrived from Spanish-speaking countries. The school has a stellar academic record thanks to its strong college-readiness culture and teachers who are committed to helping students achieve at high levels. Manhattan Center for Science and Mathematics has some 9th grade seats open in its bilingual Spanish program as well as some seats for 10th-graders or students with special needs in both of its programs. The N.Y.C. Museum School attracts students from across the city, drawn to its theme and strong record of performance. Students visit museums, parks, houses of worship and other venues to enhance their studies. Museum studies culminate in a portfolio, project or performance. Talent Unlimited High School combines a strong performing arts program with engaging academics. At Urban Assembly Maker Academy, students take a full load of academic classes in addition to learning technology and design skills in “maker” classes. 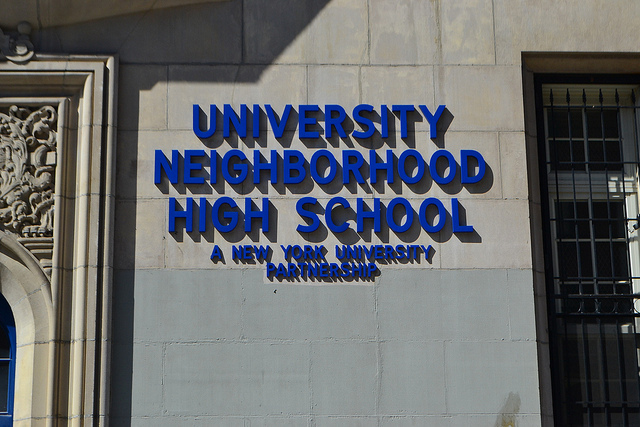 University Neighborhood High School is a nurturing school with a strong collaboration with NYU. Some well-regarded schools still have seats available for 9th-graders with special needs, 10th-graders (general and special education) or both: Baruch College Campus High School; Beacon High School; Central Park East High School; City College Academy of the Arts; High School for Dual Language and Asian Studies; High School for Environmental Studies; High School for Health Professions and Human Services; High School of Economics and Finance; High School of Fashion Industries; Institute for Collaborative Education; Manhattan International High School; Manhattan Village Academy; Millennium High School; NYC Lab School for Collaborative Studies; Professional Performing Arts School (PPAS); School of the Future; and Young Women’s Leadership School. Benjamin N. Cardozo High School has a few 9th grade seats open in its dance program as well as a few seats for 10th-graders or students with special needs in several programs. Excelsior Preparatory High School has a tiny, rigorous “Gateway” program for students who want to pursue careers in math, science and medicine. It also offers a liberal arts program that has more flexibility in course choices. Hillside Arts & Letters Academy is a small, well-run high school that offers students four years instruction in either are or music. The school has a particularly strong record of achievement for students with special needs and those learning English. Hillcrest High School is a large, comprehensive high school offering many types of classes, sports teams, clubs and activities for students with special needs. It has space for zoned students and 9th-graders interested in its theater and pre-med programs. There are also a few spots for 10th-graders in all of its themed programs. At the International High School At LaGuardia Community College, immigrants from around the world learn English while taking challenging academic classes. All students take college courses and many earn a two-year-college degree in addition to their high school diploma. At the Preparatory Academy for Writers, students write extensively in all subjects and work a lot in small groups on engaging assignments. Queens Collegiate is a small high school housed in the Jamaica High School building that offers students lively classes, lots of art and music, and plenty of attention. Queens High School for Information, Research and Technology offers classes in computer science and a nurturing environment that is particularly welcoming to recent immigrants. Queens High School for Language Studies has enthusiastic teachers and a calm and friendly vibe. It is modeled after the successful High School for Dual Language and Asian Studies in Manhattan. Queens High School for Teaching, Liberal Arts and the Sciences is an inclusive school that teaches compassion as well as engaging academics and does a very good job supports all of it students including those with special needs. Robert F. Community High School does a good job serving a broad range of students, offering all a warm atmosphere, enthusiastic teachers and rigorous academics. These popular schools still have seats available for 9th-graders with special needs, 10th-graders (general and special education) or both: Academy of American Studies; Aviation Career & Technical Education High School; Baccalaureate School for Global Education; Bard High School Early College-Queens; Bayside High School; Francis Lewis High School; Frank Sinatra School of the Arts; Middle College High School; Queens Gateway to Health Sciences; Thomas A. Edison Career and Technical Education High School; Townsend Harris; and Young Women’s Leadership School, Astoria. Curtis, New Dorp, Port Richmond and Tottenville are large, comprehensive high schools that have space for zoned students and some spots available in select themed programs. All students, regardless of the program they’re enrolled in, benefit from a large array of classes, sports teams, clubs and activities. Susan E. Wagner, which has space for zoned students and a few spots for 9th-graders with special needs or 10th-graders (general or special education), is a well-regarded high schools with strong instruction and lots of activities to keep kids engaged. Students looking for a CTE (Career and Technical Education) school should consider Ralph McKee, especially for technology, including its award-winning robotics program. Did we miss any schools? Current parents and students, please post comments with your best bets.